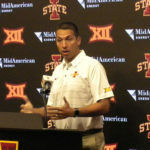 Iowa State has not been a one-hit wonder under coach Matt Campbell. After beating Memphis in the Liberty Bowl a year ago the 24th ranked Cyclones are preparing to take on 13th ranked Washington State in the Alamo Bowl. The Cyclones have enjoyed the best back-to-back seasons in school history. The Cyclones are 8-4 and a victory on Friday night would equal the school record for wins. Junior running back David Montgomery is confident the program will continue to make strides. “If we continue to prepare and we sacrifice I feel like the ceiling is high”, said Montgomery.